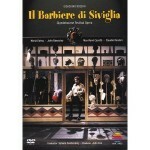 This colorful, intimate Barbiere never fails to bring a smile to my face. Both sets and costumes are charming, with the two-dimensional cutout backdrops truly evoking Seville’s architecture, and the staging is top-notch. A few scenes are handled conservatively (e.g. the stand-and-sing Act I finale), but other moments are inventive (e.g. the transition from the street to Figaro’s barbershop at the end of the first scene), and all the interactions between the characters are fantastic. In short, it’s an excellent small-scale, traditional production: both sunny and cozy, without any overdone slapstick, and filled with vivid characterizations. John Rawnsley is an outstanding Figaro, with a rich, powerful baritone and charm to spare. I doubt any Figaro has ever been funnier, jollier or wittier than this roly-poly, moustached specimen. Maria Ewing’s Rosina is an equally sparkling presence, despite being saddled with a silly bubble-‘do wig. Her voice is slightly unwieldy on high notes, but otherwise fine, and she’s completely convincing as an exuberant, cunning and adorable young girl. Max-René Cossotti is a slightly mature yet charming Almaviva, dignified as a count yet expertly goofy in his disguises, with a slightly brazen yet handsome tenor. 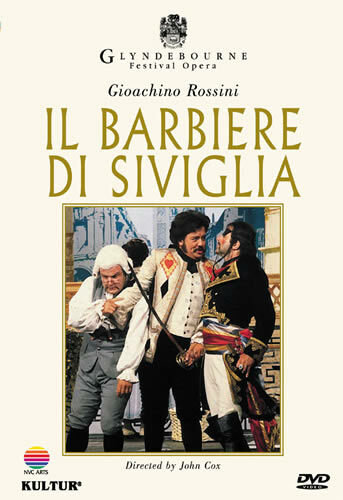 As Dr. Bartolo, Claudio Desderi displays his usual strong voice, excellent patter and fine acting. He’s less funny than other Bartolos, but this seems to be intentional, making the doctor a dry fuddy-duddy in contrast to the quirky, cunning characters who run him ragged. Meanwhile, Ferruccio Furlanetto is an endearing ham of a Don Basilio, with a sumptuous bass voice and priceless facial expressions. Sylvain Cambreling conducts with an expert hand, sometimes slowish but always effective, with the standard cuts. 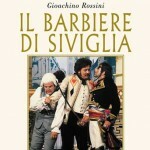 Excellent camerawork completes this Barbiere’s charm, though the DVD subtitles tend to paraphrase more than translate. At any rate, I recommend it highly, either as an introduction to the opera or as an addition to anyone’s collection.